I spent all morning today going through my photos from August. I’m still keeping up with my 365 project and it’s going well, but holy CRAP, the photos. When you take pictures every single day, they really add up. I had over 550 photos from August to sort through – this was after daily reviews where I deleted the blurry ones or the ones with closed eyes. After extreme purging I still had 330 leftover to rename, sort, and comment on. Of these, I chose about 35 to print – mostly shots of things we did this summer that the kids will want to remember. Of those, there are seven – SEVEN out of hundreds – that I consider to be really good pictures. Quality shots of the kind that you might want to frame. And I’m not talking professional photographer quality here – just shots that came out well that I am not embarrassed to show people. SEVEN. The best photo I took all month, and I am not even kidding. I have to say that after all this time I really thought I would get better. I am a firm believer that the more you do something, the better you get, and if you want to be good at something, you need to put the time in. Natural talent might exist, but for me it’s all about the hard work. So I’m rather frustrated that my photography skills don’t seem to be inching towards quality in any way. I took a class with the fabulous Anna Epp this past spring and she taught me how to use the camera on manual mode, and I have been practicing at that every single day, and yet, the camera on automatic mode can always, ALWAYS, take a better shot than me. I don’t think I have a good point here, other than that pure experience in this case does not seem to be moving me forward. So I guess I should be checking out some photography blogs? Reading books on photography? Maybe taking some more classes? In other news, my friend Miker wrote yesterday to let me know that CTV has not renewed So You Think You Can Dance Canada for another season. Apparently the ratings were way down this summer. I forgot about my blog’s superpowers when it comes to dance show and I complained with no regard for responsible use of that power. I mean, obviously there were huge problems with the show, and also CTV is at fault for scheduling it when it did (concurrent with the American version, whereas previously it hasn’t really kicked into gear until after the American one ends, which in my opinion, made a HUGE difference to the ratings this year). But I will miss the ability to actually vote, I will miss Luthor and Shotyme’s choreography, I will miss intense doses of The Cheeseman, and I will miss the odd sighting of Dan Karaty and Mia Michaels, who seem to be on the outs with the American version. I’ve also been having problems with my camera lately. I went to Toronto (again) and most of my photos came out blurry! I think the only thing you can do is play around with it and eventually you’ll get it! Hm, hope not. I always say, if you can’t see the eyes, it’s fair game. 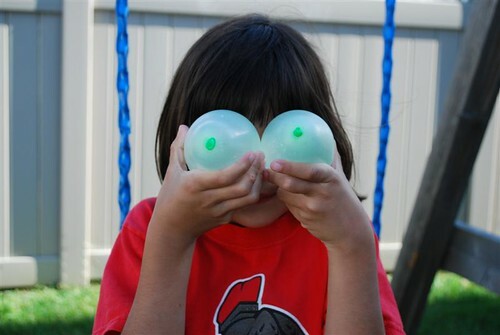 She doesn’t often walk around with water balloons in front of her face :). If you’re using “manual mode” on a point-and-shoot camera, you’re limiting yourself by your equipment. DSLRs can be expensive, but at some point if you’re interested in photography you’ll have to make the switch. 1. First step is a decision: Switch to Aperture priority mode if he’s relatively still; Switch to Shutter priority mode if he’s active. These modes are “automatic” except one setting. For aperture priority shots, I use the second- or third-biggest aperture because apparently things get wonky when “wide open”. For shutter priority I just make sure it’s 1/60 or faster. 2. Next, frame him as tightly in the camera as possible. For shots in which his face is the main thing, I don’t even mind cropping off the top of his head. If I need his whole body in there, I try to get the minimum amount of interesting scenery or background objects to set the scene, and that’s it. 3. Focus and shoot. What I mean by this last one is, quickly make decisions and quickly take that shot because the moment will pass if you don’t. Heck, take 2 or 3 quick shots to avoid eye-blink. 4. Assuming the monkey is still game for shots or hasn’t noticed me yet, switch to a different angle altogether. Take more shots. Practice only makes perfect if you’re practicing techniques. Tonnes of articles on the web; pick ONE technique that interests you (say, “getting a blurred background”) and practice it until you’re ready for a new technique! And don’t beat yourself up– that shot of the big balloon/insect-eyes is wonderful, and I’m sure you have tonnes of other wonderful shots to go with it! “you’ll have to make the switch” is bull-pucky BTW, for anyone reading. What I REALLY meant was, “there are options only available to cameras with large sensors; these are physical restrictions.” Nobody HAS to have a DSLR to get great photos; you simply have to take photographs within the known limitations of the point-and-shoot. I do have a DLSR, a Nikon D90. Thanks so much for the advice about aperture/shutter priority modes – I’ve never tried these and had no clue what they were for. I’ll give it a shot and see what I can do. Yesterday I figured out that one of the reasons that automatic mode does better than me, especially for indoor shots, is that it changes the ISO in addition to the shutter/aperture on the fly. So that’s something new to play around with, too. Have you ever taken any classes in town? No, I haven’t. A bunch of old knowledge from highschool photography (SLR and a darkroom!) came back, and I confirmed a few things by researching online. Didn’t mean to give the same advice twice, just wanted to reinforce that in those modes there’s only 1 new piece of information you need to learn, so there’s no time like the present to jump in. When I got my DSLR I just practiced taking pictures of whatever crap I could find. A drinking glass on a table. Some flowers outside even if they weren’t beautiful. Then I mostly threw those in the trash because they weren’t very interesting; but it was the technique of “blurred backgrounds” that I wanted to try to learn. HOLY CRAP I YAP A LOT!!!! Wait, I want to qualify that – charged with killing the show with their fake enthusiasm and boring compliments. I kind of had a soft spot for Jean-Luc. My husband does a HILARIOUS impersonation of him. “You, for me, are like the egg salad sandwich of the dance world. BE THE SANDWICH. We love you!” Hee hee. I never liked Leah Miller at all, though. I can see in her a not-bad one-on-one interviewer but she just didn’t have the sudsy affection required to be a hostess. Wonder what she will do now. We’ve used a series of Canon point-and-shoots and have always been reasonably happy, but with our latest (SD1400) the quality seemed to have gone downhill. I finally got fed up with too many blurry shots that I thought were fine at the time (yeah, my eyes are now bad enough that I can’t really tell by looking at the display, but so what – there was no reason for the damn thing not to have focused, it’s 2011 ferchrissakes). So we bit the bullet and got a low-end DSLR and wow, what a difference that makes. I mean, no doubt we could have done much better with the P&S’s, but that would require learning that I have neither the time and interest for. Instead, (once again taking a page from Sir Monkeypants’ book) we just “threw money at the problem” and it went away. DSLRs rock. Sadly, I already do have a DLSR. We bought it a few years ago and just using it on automatic mode made a huge, huge difference in the quality of our photos. So maybe I’m just spoiled. I think my problem is that I have been looking at too many pro or semi-pro family photographer shots online, and wondering how they get that creamy glow to their kids’ skin, or make kids’ eyes so pure and full of colour, or get everyone looking happy yet totally natural at the same time. GAH. The more I read online about it, the more I read the advice to just take a LOT of pictures. So guess I’ll just keep on truckin’. While taking photos of a group, ask everyone to stick out their tongue or make a funny face. When they are finished, snap a few shots and you will get the natural smiles and looks. I closed up shop a year ago but you can e-mail me at natalie@heathphoto.ca if you would like to chat a bit about photography.